Let’s hear it for non-fiction! I have just had the most entertaining and informative week (and I get to write a seriously disconnected title for a post). Curt Mekemson‘s book, The Bush Devil Ate Sam…And Other Tales of A Peace Corps Volunteer in Liberia, West Africa, is an important record and a serious story, yet told easily, and with delightful humour. This is one of the most satisfying books I have ever read, because it entertained me thoroughly AND made me feel better informed. In America in the 1960s, Berkeley was one of the cradles of independent thinking. Here, youth, hope and idealism produced (for a while) creative, open-minded solutions to world problems. Curt was there and tells us how it really was. From there we go with Curt and his wife, as raw Peace Corps recruits, to Liberia. Curt never fails to spot the funny elements of his varied adventures and he writes with an pleasing straightforwardness. Their lives as told are crammed with, hair-raising, deadly serious and laugh-out-loud details. The story is brought up to date with a resumé of the events of the breakdown of the country in the 1980s and the current fragile peace including the testing events due to the appearance of the Ebola virus. In spite of Liberia’s difficult and often tragic past, reading Curt’s memoirs in The Bush Devil Ate Sam gave me a sense of hope for the country and the wider continent. My other book, 84 Charing Cross Road, is a smidgeon of a story – 96 pages of short letters from 1949 to 1969 between Helene Hanff, a New Yorker, and Frank Doel, who works in an antiquarian bookshop in Charing Cross Road. The contrasts between Britain, book-rich and food-poor, and America, the reverse, shape the correspondence. Helene’s voice is totally original and utterly beguiles not only Frank, but all the staff at Marks and Co Booksellers as does her generosity during the rigours of rationing. This book was an instant hit on publication and there is also a film (with Anthony Hopkins and Anne Bancroft), which I am aching to see. The edition I bought (secondhand) includes the sequel, The Duchess of Bloomsbury Street, which I also highly recommend. This is another very short book, all taking place in 1971 in London, as a consequence of the publication of 84 Charing Cross Road and provides a satisfying coda to it. These two records reveal the wonder of England and English literature through post-war American eyes. This entry was posted in Reading, Writing notes and tagged 84 Charing Cross Road, Curt Mekemson, Helene Hanff, The Bush Devil Ate Sam, The Duchess of Bloomsbury Street by hilarycustancegreen. Bookmark the permalink. 84 Charing Cross Rd is up there with my favourite books ever. Kerouac, Steinbeck and Leon Uris. But she I was in love with her from the day we met – she inside a book and me wrapped in it. There is one line that always made me smile. When addresses his letter to her at the beginning, Dear Madam, and she replies In her NY uptown way with a “I do hope ‘madam’ means something different in England than it means in America” It’s been a while but that’s the jist of what she says. I admit I read it with a continuous chuckle. I usually read snippets out to my husband as he doesn’t necessarily read the same books, but with this one I refused to tell was i knew how much he would enjoy it. He is reading it at this very moment. Love 84 Charing Cross Road – the film is fabulous too. Hooray. I shall get hold of it. A remarkable story of Curt and Peggy in Liberia, but there is a lot more to them, adventurers extraordinaire. They are either in a canoe paddling in the arctic sea somewhere or are watching huge sculptures in flames at ‘Burning Man’, climbing mountains or traversing deserts. Curt rode a bike for thousands of miles with a luggage-pack that even a camel would refuse. An inspiration for everyone. I know he is a remarkable man, as is Peggy… (the wife in the story, Jo Ann, predates Peggy). I have been riveted to his blog ever since I first came across it. The book really comes up to and exceeds expectations, I highly recommend it. 84 Charing Cross Road is one of my all-time favorite books and the movie does it proud. No movie can ever entirely capture the charm of a book like this, but I can’t imagine them doing a better job than they managed to do. Anne Bancroft was a marvel and Sir Anthony? Well, has he ever done a bad job? Thank you for this reminder of such a favorite – I may have to reread soon just to immerse myself in that literate world again. I didn’t know when it was recommended to me, that it was already such a favourite. I will certainly be re-reading it at intervals. Isn’t it funny how some books and/or authors completely escape our radar? I’m always astonished to find there’s an author with a rabid following and I’ve never even heard of him or her. Yup, I had never heard of Hanff, never mind the film with all those famous peele in it! Loved 84 Charing Cross Road. 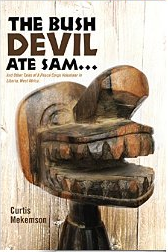 I will look for “The Bush Devil ate Sam” thank you for the recommendation. Thanks, they were both among my best reads for many months. I like your way of reviewing…makes one want to read the books….and I certainly would get into these two if I were still doing that kind of reading…Thanks for the view! Well, the Hanff is more or less poetry and my guess is that you would delight in her taste in literature (Donne amongst others). 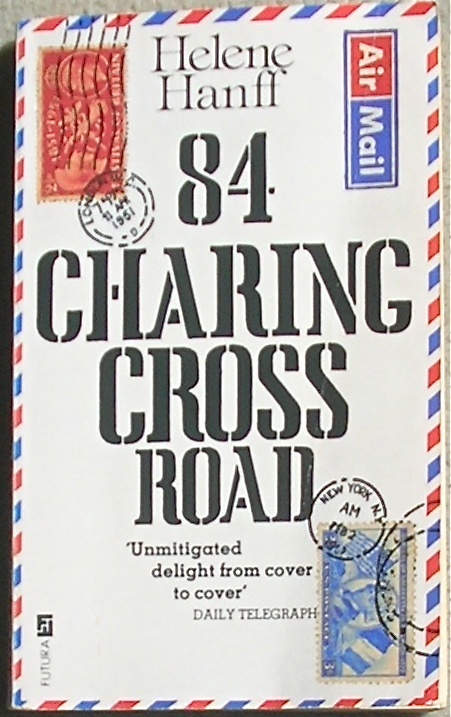 A used copy of the movie 84 Charing Cross Road, starring Anne Bancroft, Anthony Hopkins and Judi Dench, is available from Amazon for as little at $2.99. I am not an Amazon employee or stockholder. I am simply telling you how I got my copy. That’s my plan, I just haven’t got there yet – a pleasure to come. It is a very heartwarming movie. Thanks, I hope word gets around. I truly loved them both, so it was easy. You always demur. I refuse to allow you to get away with that: you are an EXCELLENT REVIEWER !!! OK I will smile, blush and feel uplifted. I can’t wait to read Curt’s book. I know I won’t be able to put it down. Thanks for the reminder. We haven’t got Netflix, but I have just ordered the DVD. I can’t wait. I’ve read 84 Charing Cross Road several times, and also saw the movie, but did not know about The Duchess of Bloomsbury Street. Thanks for revealing its existence to me! It is a real delight, too, and completes the picture. I have just got the DVD of the film. Curt does have a fun writing style!! You are right, I spent a lot of time laughing as I was reading. Absolutely loved Charing Cross Road. Can’t wait to get the other two. Thanks! Enjoy. We now have the DVD of the film and saving it for a rainy day.